Longing to take a break and unwind but don’t want to do the same old pub-hopping routine? If you’re up for some hookah, there’s plenty for you to choose from. With happy hours, combos and even exciting flavours on offer, hit up a hookah bar in town. Trying to do things differently, the hookah menu at this vast place off Cunningham Road (and HSR Layout, if that's closer) is interesting. Since you’re encouraged to take your time and enjoy the cocktails and food here, try as many flavours as you can — from mint, watermelon and cool lemon to the more exotic supari, Maghai pan and cigar. Upbeat, fun and every bit quirky as you’d expect, The Open Box adds to its chill vibes with hookah. Mint, watermelon, green apple, cranberry there’s all sorts of flavours, and you get to pick it off a menu, that’s on an alcohol bottle. Yup, they’re setting the right mood. Since it’s a rooftop space, it’s our pick to enjoy an evening of bar nibbles, pool and sheesha. A rooftop restaurant with splashes of colour adding to its cheery ambience, Kargeens is a favourite among sheesha lovers in the city. And, why not, when you get to pick from flavours like Kargeens Fruit Exotica to Orange and Apple? And, while you sit back, lost in a conversation with your buddies (and enjoying a smoke, of course), the staff will promptly refill your hookah dose and change the coals as well. And, there’s enough food to tuck into as well. Think a selection of wraps, sandwiches, pizzas and pastas. This all-day restaurant is your answer to late night food and hookah cravings. Located on the way to Mysore, Rasta Cafe has a separate open area for smoking, where you can pick from their choice of flavours. While you’re at it, make sure you pair it with their wood-fired pizzas or a chicken wings platter. If you'd rather not make that trip, there's also one at Church Street! Having been around since 2008, this sheesha lounge has a menu that is bound to please you. Flavours like grape, vanilla and cappuccino along with their signature mixes (pick from mild or strong ones) like Brainfreezer and Apple Crumble will spoil you for choice. And, if you need any more reason to get you going, they have happy hours (11am-5pm) when you have a 1+1 offer on the sheeshas as well as an offer that lets you get a regular one free when you order a hookah with an ice base. They recently introduced combos which include starters and coolers along with your choice of hookah. Apart from their delightful starters, filling burgers and sandwiches, Blow Cafe also has a menu for hookah and the entire first floor devoted for smoking. While the flavours here include the regular Double Apple and Mint, we also spotted Paan Rasna, Kiwi and an intriguing Secret Hookah. So, pick your favourite, sit back and smoke way while catching up with friends or watching a game (they often have match screenings). 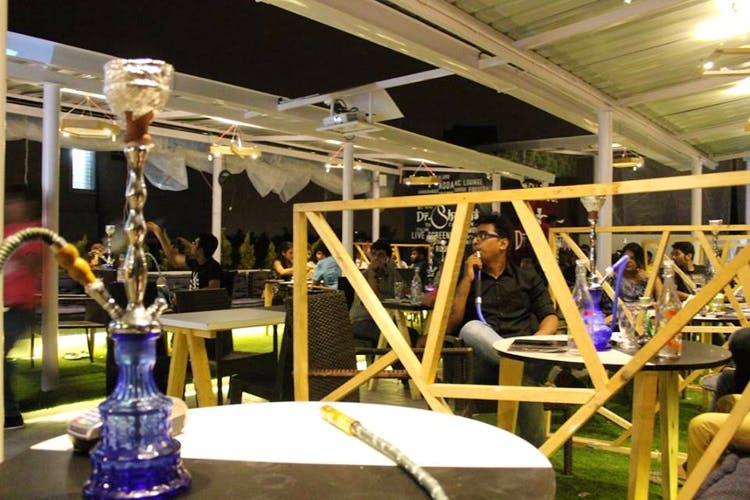 While they do have indoor seating, we suggest you opt for the charming rooftop space if hookah is what you have in mind. Their selection of house blends include everything from Grape with Supari to the fruity Blueberry, Peach and Vanilla combination. And, with Red Bull, Coconut Water, Orange and even the popular ice bucket as options for bases (available for an additional cost), they really try to make sure you get to have some varied flavours. Load up on the light eats to keep you going. The latest to join the list of hookah lounges in the city, Entropy Cafe makes for a great weekend hangout spot. Apart from the house blends (think X on the Beach and Orange Rasna Mint) available in bases like milk, 7Up and Red Bull, they up the quirk factor with their presentation. So, don’t be surprised if they bring a hookah that looks like a gun to your table. The first thing that will lure you here would be the ambience and the decor. Done up in a mix of Mediterranean, Arabic and Moroccan influences, the place might make you feel like you’ve stepped into another world. Along with the Persian, Mughlai and Mediterranean dishes here, they also offer hookah. Apart from single and double flavours (from Strawberry and Gum to Kiwi Mint), they have three special options – Item Bomb, Fruity Mix and Kuch Katti Kuch Mitti. While Bamboo Heights has quite a few hookah flavours for you to choose from, we suggest you go for their pocket-friendly combos which give you options like espresso and fries or Crispy Chicken Burger and choice of milkshake to go with your sheesha. And sitting under the cabana setting, you might as well be on vacation. A cafe and hookah lounge rolled into one, Soul Cafe keeps it simple with their food as well as the smoking options. Think sheeshas with the kick of mint or the tanginess of orange to go with your snack. While they have bases like watermelon, ice and milk, if you have a specific preference, they might even try to get it for you. Whether it is the warm and friendly service, the happy vibes or the great hookah, Cafe Mist gives you enough reasons to head there. Once you find yourself a cosy spot, go for one of their combos (sheesha, food and drink). So, when you do take a break from deep drags of the hookah (they have single flavours as well as blends), you’ll have enough to munch and sip on. Make your way here a little early in the day and you can score two sheeshas at INR 500 during their happy hours (11am to 4pm). The comfy seating (with plenty of cushions thrown in) and the laidback ambience might just be what you need after a tiring workday. Add to that some comfort food (think fries, pasta and burgers) and a spot of hookah and you’ve got yourself the perfect recipe to unwind. Look out for their blends with quirky names – Enemy of the Cats (supari, paan and mint), Dolls of Voodoo (paan, grape and mint) and Pirates (Silver Fox, Brainfreezer and orange), to name a few.